Players who pre-order Killzone: Shadow Fall will get exclusive skins and skills for their OWL combat drone. While Killzone: Shadow Fall looks as though it will feel nice and familiar for returning fans, the game's developers at Guerilla Games are introducing a few new tools to help players dominate the battlefield. One of the biggest is the OWL, a combat drone that will follow players during gameplay and that they can deploy at will to perform a variety of functions to aid in combat. Perhaps hoping players will fund the OWL appealing enough a feature to buy the game, Guerilla has announced pre-order bonuses centered around the expansion and customization of the OWL's appearance and skill set. 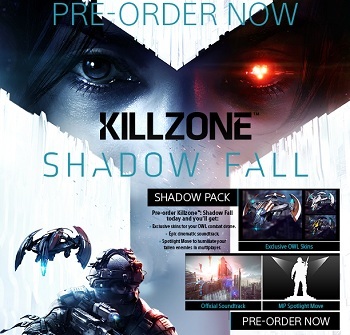 "To allow you to tailor your gameplay experience even further, we're happy to announce the Shadow Pack - a bundle of exclusive content you'll receive for pre-ordering Killzone: Shadow Fall at participating retailers," said Guerilla. The bundle will include exclusive skins for the OWL, a Spotlight Move that players can deploy in multiplayer and the game's official soundtrack. "The only way to obtain the Shadow Pack and get your hands on these exclusive bonuses is by pre-ordering the game!" Whether or not players opt to do that just yet, there's no denying that the OWL is a pretty nifty addition to Killzone's gameplay. As exhibited in footage shown off during E3, the developers have given the drone a lot of skills and abilities that look as though they could make it legitimately useful and not just a floating bullet point to put on the back of the box.